This two-day training will take place on December 4th and 5th from 9 am – 6 pm. 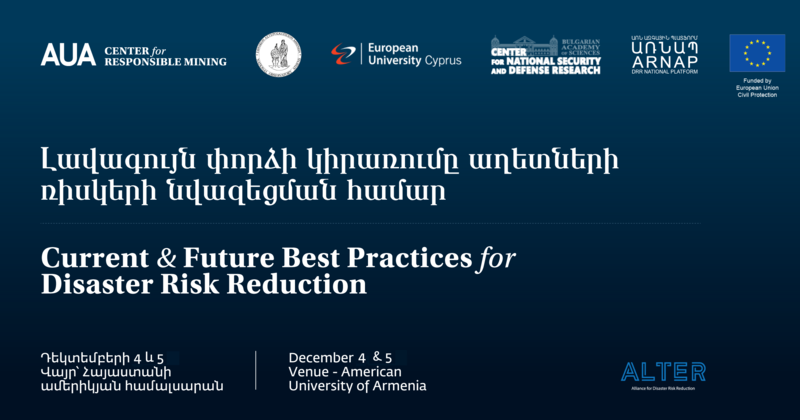 It is hosted at the American University of Armenia and is presented by the ALTER (Alliance for Disaster Risk Reduction) project, funded through the European Union Directorate for Civil Protection. Two days of training sessions will focus on the project’s primary focus – flood risks as they relate to dams and earthquakes. Topics are on a variety of seismology, hydrology, GIS, and remote sensing topics presented by top scientists from Armenia and the European Union.